So what exactly can be placed in curbside recycling bins? 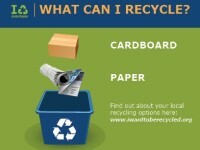 Do you know what can be placed at your curb on recycling day? The ten items listed are cardboard, paper, food boxes, mail, beverage cans, food cans, glass bottles, jars (glass and plastic), jugs, and plastic bottles and caps. The infographic also mentions that plastic bags and plastic wraps, electronics, and textiles, while also commonly recycled, should not be placed in curbside bins. The idea behind this education effort is to prevent “wishful recycling” which causes materials not locally recycled to end up contaminating the materials collected. For more about recycling education, read Americans Need More Recycling Education and Plastics Making Your Head Spin? Image credit: The National Waste & Recycling Association.